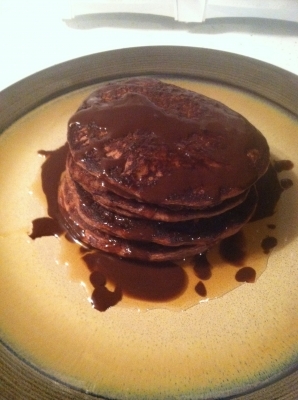 Delicious protein pancakes that is for the chocolate lovers! Add all dry ingredients into a bowl and mix together. Then add all wet ingredients and mix to make batter. Heat pan to medium heat, spray with non stick cooking spray or use coconut oil. Pour batter into desired sized pancakes and cook for roughly 30-45 seconds per side. Top with Walden Farms chocolate syrup or desired toppings for pancakes.